KTMtwins.com KTM Motorcycle and Product News: Cheer on our friends at Project K Racing this year! Cheer on our friends at Project K Racing this year! I bet you haven't even thought about turning your 950 Super Enduro into a fire breathing quarter mile killer. 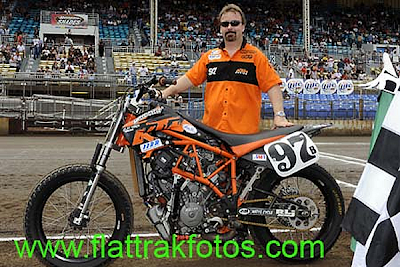 Our friends at Project K Racing did and they are racing one in the 2009 AMA Grand National Championship Series. Keep an eye out for them and cheer them on August 29Th at the famous Indianapolis Fair Grounds Dirt Track. We will. Rally Fairing for the KTM 690 Enduro! KTM LC8 Slipper Clutch Sale!